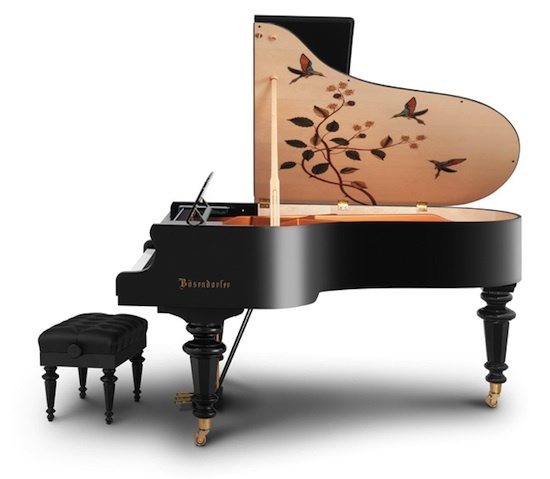 Yamaha has unveiled the first design of Bösendorfer’s new Marquetry Series of grand pianos, including the 200-SP Hummingbird pictured here. 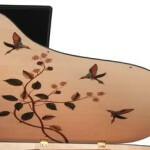 Marquetry is the use of many pieces of different types of wood veneer to create images and has long been viewed a symbol of wealth. Many fine examples of marquetry can be found in the Imperial Palaces of Vienna, including the Schoenbrunn Palace, the summer residence of The Austrian Habsburg Imperial Family. 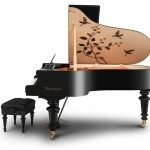 While many historical pianos have included marquetry designs, they have seldom been re-envisioned for the 21st Century. The Austrian Habsburg Imperial Family was delighted by exotic images of nature, covering the walls of their intimate music room with wonderful jungle scenes. The Palace, outfitted with a suite of rooms featuring exotic garden panoramas commissioned by Maria Theresa and hand painted by the celebrated 18th Century Bohemian Ornamentalist painter Johan Wenzel Bergl, played host to six-year-old Wolfgang Amadeus Mozart, who performed for the Empress Maria Theresa at Schoenbrunn. Availability information to be confirmed.